by Chris Woodford. Last updated: December 1, 2018. Cars are amazing! And one of the most amazing things about them is that no-one invented them—no single person, that is. There was no scribbling on the back of an envelope, no lightning flash of inspiration, and no-one ran down the street crying "Eureka". All the different parts—the engine, the wheels, the gears, and all the fiddly bits like the windscreen wipers—somehow came together, very gradually, over a period of about five and a half thousand years. How did it happen? Let's take a closer look! Photo: Museums like Wheels of Yesteryear, pictured here, teach us that the history of cars has evolved through shifts in fashion and culture and as well as improvements in technology. Photograph courtesy of Carol M. Highsmith's America Project in the Carol M. Highsmith Archive, Library of Congress, Prints and Photographs Division. It all began with the horse. Or the camel. Or perhaps even the dog. No-one really knows which animal prehistoric humans picked on first. People tended to stay put, living more locally than they do now. If they needed to move things about, they had to float them down rivers or drag them by sledge. All that started to change when humans realized the animals around them had raw power they could tap and tame. These "beasts of burden" were the first engines. Photo: Beasts of burden: animals were the original engines. Native Americans of the Blackfoot Confederacy walk alongside a travois: two long poles crossed at the front to make a dragging frame that can carry heavy loads. Photo courtesy of US Library of Congress. By about 5000BCE, there were sledges and there were animal "engines"—so the obvious thing to do was hitch them together. The Native Americans were masters at this. They invented the travois: a strong, A-shaped wooden frame, sometimes covered with animal skin, that a horse could drag behind it like a cart without wheels. First used thousands of years ago, the travois was still scraping along well into the 19th century. The next big step was to add wheels and turn sledges into carts. The wheel, which first appeared around 3500 BCE, was one of the last great inventions of prehistoric times. No-one knows exactly how wheels were invented. A group of prehistoric people may have been rolling a heavy load along on tree trunks one day when they suddenly realized they could chop the logs like salami and make the slices into wheels. However it was invented, the wheel was a massive advance: it meant people and animals could pull heavier loads further and faster. Huge and heavy, the first solid wheels were difficult to carve and more square than round. When someone had the bright idea of building lighter, rounder wheels from separate wooden spokes, lumbering carts became swift, sleek chariots. The ancient Egyptians, Greeks, and Romans all used chariots to expand their empires. They were a bit like horse-drawn tanks. Photo: The first wheels were made of solid wood. By the early 20th century, car wheels had thin metal spokes similar to bicycle wheels, which make them lighter and easier to turn. Earlier civilizations made small steps by trial and error. The ancient Greeks (the first real scientists) took giant leaps. Greek philosophers (thinkers) realized that a wheel mounted on an axle can magnify a pushing or pulling force. So people now understood the science of wheels for the first time. The Greeks also gave us gears: pairs of wheels with teeth around the edge that lock and turn together to increase power or speed. Carts and chariots were a big advance on legs—but they were useless for going cross country. That's why ancient Middle Eastern people and Mediterraneans, who lived in open grassy areas and deserts, developed chariots faster than Europeans and Asians stuck among the forests and scrub. The Romans were the first to realize that a car is only as good as the road it travels on. So they linked up their empire with a huge highway network. Roman roads were cutting-edge technology. They had a soft base underneath to drain away water and a harder top made from a patchwork of tight-fitting rocks. The Greeks gave us gears, the Romans gave us roads—but when it came to engines, the world was still stuck with horsepower. And things stayed that way for hundreds of years through a time known as the Dark Ages, the early part of the Middle Ages, when science and knowledge advanced little in the western world. Things finally started getting interesting again toward the end of the Middle Ages. In 1335, Dutchman Guido von Vigevano drew sketches of a "Windwagen". It had the three key parts of a modern car: an engine (spinning windmill sails), a set of wheels, and gears to transfer power between them. During the Renaissance (the explosion of culture and science that began in the 15th century), Italian inventor Leonardo da Vinci (1452–1519) scribbled some designs for a clockwork car. Like a giant watch, it was supposed to be powered by springs that would drive the wheels through a system of interlocking gears. Even though there was little mileage in either of these ideas, the self-powered car was slowly coming together and the days of the horse seemed numbered. The next major development came in 1712 when "the very ingenious Mr Thomas Newcomen" (as his friends called him) built a massive machine for pumping rainwater out of coal mines. It was based around a huge 2-m (7-ft) high metal cylinder with a piston inside that could move up and down like the plunger in a bicycle pump. Every so often, steam from a boiler (a sort of gigantic coal-fired kettle) squirted into the space in the cylinder underneath the piston. Then cold water was squirted in to make the steam condense, creating a partial vacuum directly under the piston. Since the air pressure in the space above the piston was now greater than that in the space beneath it, the piston moved down. When the vacuum was released, the piston rose back up again. The rising and falling piston operated a pump that slowly sucked the water from the mine. Machines like this were originally called fire engines—they were, after all, powered by burning coal—though they soon became known as steam engines when people realized that controlling steam was the key to making them work more efficiently. One of those people was a Scotsman named James Watt (1736–1819). In 1764, Watt redesigned Newcomen's engine so it was both a fraction the size and more powerful. Where Newcomen's piston had simply tipped a beam up and down, Watt's turned wheels and gears. Large Watt engines soon found their way into factories, where they became the powerhouse of the Industrial Revolution and people did away with horses for operating pumps and other machines. Coal seemed to be the fuel of the future. Steam engines were still too big and heavy to use in vehicles, but that didn't stop people trying. In 1769, Frenchman Nicholas Joseph Cugnot (1725–1804) used steam-engine technology to make a lumbering, three-wheeled tractor for pulling heavy army cannons. Many people consider this the world's first car, but it was incredibly primitive by today's standards. With a top speed of just 5 km/h (3mph), you would have thought it posed little danger. But the "fardier à vapeur" (steam wagon) was heavy and hard to steer and, just two years later, the first ever car had the first ever car crash when Cugnot rammed it through a brick wall. He was given a speeding ticket and thrown in jail. Steam engines were soon finding their way into other heavy vehicles. In the early 1800s, Cornishman Richard Trevithick (1771–1833) started building steam carriages with wobbly 3-m (10-ft) diameter wheels. Around this time, Trevithick's American counterpart Oliver Evans (1755–1819) built an ambitious steam-powered river digger called the Oruktor Amphibolos that could drive on either land or water. Belching fire and smoke like a dragon, it caused a sensation as it chugged down the Philadelphia streets in 1804. Artwork: The Oruktor Amphibolos, built by Oliver Evans, could drive along on four wheels or steam down the river using its rear-mounted paddle. Note how the steam engine at the front uses a pulley to power both the front and rear axles, making this a very early example of four-wheel drive. Artwork from The Mechanic magazine, July 1834, courtesy of US Library of Congress. 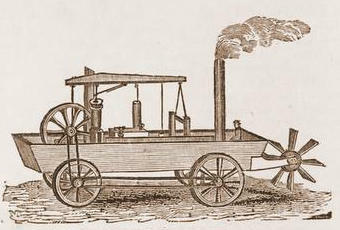 Both Trevithick and Evans ultimately switched their attention to making steam trains, but another Cornish inventor, Goldsworthy Gurney (1793–1875), was convinced the idea of steam road vehicles still had legs. Quite literally. He designed an early steam carriage that would gallop along on rickety pins, just like a horse. When Gurney realized wheels could do the job much better, he built impressive steam buses and ran a service between London and Bath. Ultimately he was driven out of business by horse-powered stage coaches, which were faster and cheaper. John Scott Russell (1808–1882) also had to close a promising steam-coach business when one of his buses exploded on 29 July 1834, killing four passengers. It was the world's first fatal car accident. Horses everywhere breathed a huge sigh of relief: they'd be around for many years yet. Or so they thought, until a clever bunch of scientists showed up. A car is like a cart with a built-in horse—a horse-less carriage that doesn't eat grass, wear shoes, or leave a steaming pile of muck wherever it goes. The engineers who set out to make the first cars had a big problem on their hands: how to squeeze the power of a galloping horse into a small, reliable engine. This tricky problem taxed the best minds of the day. The experiments with steam had been the first attempt to solve it, but though coal-powered steam engines were excellent for pulling trains, they weren't so good in cars. Apart from the clunking great engine itself, you had to carry a mini-mountain of coal and a tank full of water. Some ingenious Europeans starting searching for better fuels and more compact engines. They were a mixture of "thinkers" and "doers". Photo: Early cars were literally "horseless carriages": wooden carriages powered by simple internal combustion engines. This one is typical. Dating from 1898, it's suspended at a jaunty angle from the ceiling of Think Tank, the museum of science in Birmingham, England. The engineers were inspired by brilliant Dutch scientist Christiaan Huygens (1629–1695), who had the laser-like mind of Isaac Newton and the inventing ability of Leonardo da Vinci. He made many astronomical discoveries, invented the mathematics of probability, made the first pendulum clock, invented a musical keyboard, and discovered that light travels like a wave. In the late 17th century, Huygens had an idea for an engine that made power by exploding gunpowder in a tube. Unfortunately, he was way ahead of his time: engineering wasn't yet good enough for him actually to build this machine. If it had been, the world might have had cars almost 200 years earlier! Next up was a French army engineer called Nicolas Leonard Sadi Carnot (1796–1832), who wrote the original book of car science, Reflections on the Motive Power of Fire, in 1824. It was the first proper explanation of how engines worked, why they made power, and how you could make them even more effective. Carnot's ideas are now considered brilliant, but they were published over 100 years after the first steam engines had already been built. What was use was science when it came a century after the inventions it tried to explain? Huygens' idea to capture the power of a small explosion was what the "doers" seized on. A French-Belgian engineer called Joseph Étienne Lenoir (1822–1900) was tinkering with electricity in the 1850s when he took the next step. In those days, street lamps were naked flames fed by gas pipes. Lenoir wondered what would happen if he could ignite some of this street-lamp gas in a metal tin using an electric spark. His "spark plug" (as we now call it) would make the gas explode with a thump of power that could push a piston. If he could repeat this process again and again, he could drive a machine. The "gas engines" Lenoir built made as much power as 1.5 horses and were soon being built by the dozen. In 1863, Lenoir fixed one of them to a three-wheeled cart and built a very crude car. It made an 18-km (9-mile) journey in 11 hours—four times longer than it would have taken to walk. Lenoir died a miserable pauper because his engines, though revolutionary, were soon obsolete. Gas was a cleaner fuel than coal, but it wasn't practical—there was even a risk it would explode and kill people. Gasoline (a liquid fuel) proved to be a better bet, as German Nikolaus Otto (1832–1891) discovered. Otto was no scientific thinker—far from it: he was a traveling grocery salesman who taught himself engineering. During the 1860s, he tinkered with various engine designs and, in 1876, finally came up with a really efficient gasoline engine, which worked by methodically repeating the same four steps (or "strokes") over and over again. Virtually every car engine has worked the same way ever since. German engineer Karl Benz (1844–1929) studied Otto's work and determined to do better. After building a simpler gasoline engine of his own, he fixed it to a three-wheeled carriage and made the world's first practical gas-powered car in 1885. No-one took much notice—until Benz's feisty wife Bertha and their two young sons "borrowed" the car one day without asking and set off for a 100-km (65-mile) journey to see grandma. They bought fuel at drug stores (chemist's shops), because gas stations had yet to be invented, and the boys had to get out every so often to push the car up hills. Bertha even had to stop a couple of times to make repairs with her hair pin and garter belt. News of this intrepid early test-drive caught the public's imagination; Benz couldn't have dreamed up a better publicity stunt if he'd tried. He took his wife's advice and added gears for uphill driving. Soon he was developing successful four-wheel cars and, by the start of the 20th century, was the world's leading car maker. Artwork: Thanks to his wife's test drive, Karl Benz added gears to his car to make it easier to drive up hills. 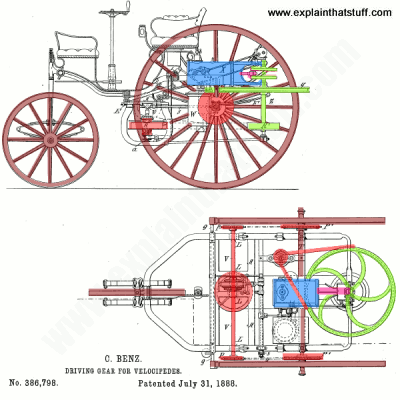 Here's a drawing from a patent he filed showing how they worked: the gasoline engine (blue) powers a piston (pink) and flywheel (green), which drives the gears (red) that power the large rear wheels (brown). Artwork from US Patent 386,798: Driving gear for velocipedes by Karl Benz, courtesy of US Patent and Trademark Office. Benz soon found himself up against Gottlieb Daimler (1834–1900) and Wilhelm Maybach (1846–1929), who worked for Nikolaus Otto, until Otto and Daimler fell out. Setting up their own firm, Daimler and Maybach experimented with a giant gasoline engine nicknamed the Grandfather Clock (because it was tall and upright). After shrinking it down to size, they bolted it to a wooden bicycle and made the world's first motorbike. By 1889, they were building cars. Ten years later, the Daimler company named a car "Mercedes" in honor of Mercedes Jellinek, the daughter of one of their customers and dealers, Emil Jellinek (1853–1918). The Daimler and Benz companies were rivals until the 1920s, when they merged to make Daimler-Benz and began selling cars under the name Mercedes-Benz. Rudolf Diesel (1858–1913) was both a thinker and a doer. Confined to hospital after an accident, he spent months poring over books and papers by people like Carnot and Otto. He soon came to the conclusion that he could build a far better engine than the puny gasoline machines Benz and Daimler had designed and knocked up a prototype, an enormous 3-m (10-ft) high machine, in the early 1890s. This first diesel engine made twice as much power as a similar steam engine and, even more remarkably, could run on practically any fuel at all—even oil made from peanuts and vegetables. Diesel, in other words, was a pioneer of biofuels long before people had a name for them. Diesel was convinced of his genius and certain his engine would change the world, but he never lived to see the success he'd earned. In September 1913, while traveling from Germany to England on the mail ship SS Dresden, he fell overboard and drowned. Some people think he was murdered by German or French secret agents to stop him selling the secrets of his engines to the English in the run up to World War I, which broke out the following year. While inventors like Diesel were developing engines in a careful scientific way, a hapless American called Charles Goodyear (1800–1860) found the secret of making car tires completely by accident. After learning about rubber, he convinced himself he could make his fortune by turning it into useful objects like waterproof shoes. All attempts ended in disaster and his life became a catalog of misery and misfortune. His shoes melted in the summer heat, six of his 12 children died in infancy, and his family had to live in grinding poverty eating fish from the river. But Goodyear was determined. When debts landed him in jail, he simply asked his wife to bring him a rolling pin and some rubber and he carried on inventing in his cell. He finally made his big breakthrough when he accidentally dropped a piece of rubber on a hot stove. It cooked and shriveled into a hard black mass that Goodyear immediately spotted as the thing he'd wanted all along. This is how he developed the tough black rubber we use in tires today by a cooking process now known as vulcanization. 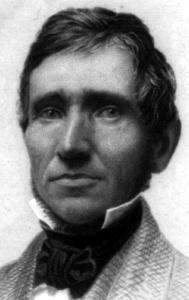 Photo: American inventor Charles Goodyear developed the vulcanization process in the 19th century. Photo courtesy of US Library of Congress. By the start of the 20th century, gasoline-engined cars were fast, reliable, and exciting. They were also stupidly expensive. In 1893, Karl Benz's simple, Viktoria car had a price tag of £9000 (about £50,000 today) and hardly anyone could afford one—he sold just 45. Car makers stuck with big, expensive cars, so customers stuck with their horses and carts. Then a bold American engineer called Henry Ford (1863–1947) came along and decided things had to be different. "It was not at all my idea to make cars in any such petty fashion"—Henry Ford, My Life and Work, 1922. Photo: Henry Ford was inspired to build his first car after he saw a steam-powered tractor (traction engine) like this one. He realized straight away that engine-powered vehicles were the future. Ford was no scientist, but he'd been repairing watches and tinkering with machines since he was a boy. Never afraid of rolling up his sleeves, he loved machinery and understood it instinctively. His first car was little more than a four-wheel motorbike that he called the Quadricycle. When he took it on the streets of Detroit in 1896, horses bolted in all directions. Ford must have been delighted: he had no time for horses. Aged 14, he'd been thrown from the saddle of a colt, caught his foot in the stirrups, and dragged home along the ground. A few years later, he'd been seriously injured when his bolting horse and cart tried to smash through a fence. Now was the time to settle those scores. Ford loved machines and hated horses, so he hatched a simple plan: he'd make the simplest possible "horseless carriage" and he'd make it in such enormous quantities, in only one color, that he could sell it cheaply to a huge number of people. It took him 12 years to get things right. In fact, he made eight different models (named A, B, C, F, N, R, S, and K) before he finally came up with a winner, the Model T, launched in 1908—a car everyone could afford. Around 15 million Model T Fords were eventually sold and a delighted (and very rich) Henry Ford scribbled in his notebook: "The horse is DONE". How the horse was "done"
"I felt perfectly certain that horses, considering all the bother of attending them and the expense of feeding, did not earn their keep." —Henry Ford, My Life and Work, 1922. 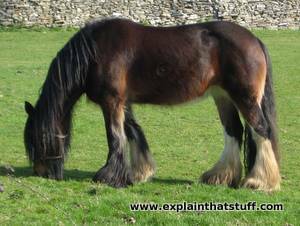 Wild horse: The horse's stomach is its fuel tank and it "burns" food to make power. "Four-leg drive" makes this the perfect, all-terrain vehicle, with a top speed of ~90 km/h (60 mph). Horse and cart (~2500 BCE): Dragging a cart with heavy, solid wheels slows the horse down to a measly 6 km/h (4 mph)—brisk human walking speed. The wheels mean the cart can carry huge loads over long distances. It's just a shame there are no roads. Roman chariot (100BCE-476CE): With four horses and two slick, spoked wheels, a racing chariot has more horsepower, less weight, and less friction to slow it down. It can reach speeds of 60 km/h (40 mph) But it can't carry much shopping. Ford's Quadricyle (1896): Ford's first car is not so much a "horseless carriage" as a horse crossed with a carriage: it has its own gasoline engine and fuel tank and four bicycle wheels instead of four legs. Its top speed of 32 km/h (20 mph) is only a third of a horse's. Model T Ford (1908): Ford's Model-T combines speed, practicality, and simplicity. Its 20-horsepower gasoline engine can race to speeds of 72 km/h (45 mph)—still slower than a galloping horse. The only thing it can't do is jump fences. Photo: Henry Ford's mass-produced cars soon became ubiquitous. 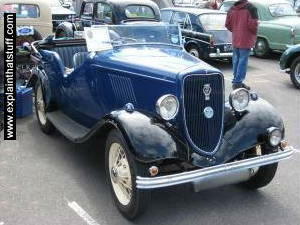 This Ford Model Y dates from 1933. Immaculately preserved, it was photographed in 2009—at the sprightly age of 76! Normally things get more expensive over time—but Ford's pint-sized miracle car, the Model T, dropped in price from $850 when it was launched in 1908 to just $260 in 1925. The secret was mass-production: making the car from simple, easy-to-fit parts in huge quantities. Other car makers used small groups of mechanics to build entire cars very slowly. By 1913, Ford was building cars at his new Highland Park factory in a completely different way using a moving "assembly line". 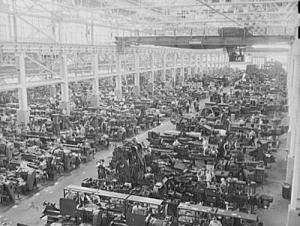 Model Ts were gradually assembled on a conveyor that inched past a series of workers. Each mechanic was trained to do only one job and worked briefly on each car as it passed by. Then the vehicle moved on, someone else did another bit, and the whole car magically came together. The first year Ford used his assembly line, production of the Model T leaped from 82,000 to 189,000. By 1923, Ford's giant River Rouge factory was making 2 million cars a year. Photo: Inside one of the many River Rouge buildings in 1941. Photo (believed to be in the public domain) by Alfred T. Palmer, Farm Security Administration/Office of War Information courtesy of US Library of Congress. Ford's most ambitious project was his sprawling River Rouge car plant in Dearborn, Michigan. Production of Model T parts switched here in 1919, though the car was still put together at Highland Park. With dozens of enormous buildings spread across a vast area, River Rouge was more like a city for making cars than a traditional assembly plant. The idea was to make cars more cheaply than ever before by taking in the most basic raw materials at one end and churning out millions of finished vehicles at the other. Giant barges ferried coal to the Rouge from Ford's own mines down the river. Elsewhere on the site, there was a steelworks, a glassworks, a cement works, a body-making plant, a sawmill, and a rubber-making plant. River Rouge even had its own hospital, police force, and a steam-electric power station big enough to light a city. All this meant it could produce one car every 49 seconds. 120 miles of assembly line conveyors. 100 miles of private railroad track and 16 trains. Total size: 2000 acres (an area the size of 1000 British soccer pitches or 1500 American football fields). 15,767,708 square feet of factory floors and 3500 mops used each month to keep them clean. Total cost: $268,991,592.07—equivalent to about £1.5 billion today! Photo: Henry Ford in later life. Photo by courtesy of US Library of Congress. Henry Ford was a big success and a people's hero: no-one did more to put cars within reach of ordinary people. But he made big mistakes too, probably because he was a mess of contradictions. Stuck in the past? Ford looked to the future—he grew soybeans to make plastic parts for cars and experimented with biofuels years before almost anyone else. He famously wrote "History is more or less bunk". But, as he grew older, he set up his own museum, packed it full of nostalgic exhibits, and spent increasing amounts of time there daydreaming of a lost era. He even had visitors driven round on horses and carts. Nostalgic? His assembly-line methods were widely copied and quickly transformed the United States from a clean and green farm-based nation into a dirty, smoky factory-based one. Yet the more industrialized things became, the more Ford yearned for the rural world he was helping to destroy. Stubborn? The Model-T Ford was a huge success, but Ford refused to update it: "There is a tendency to keep monkeying with styles and to spoil a good thing by changing it." But other car makers began introducing a new model every year and the Ford Motor Company lost its lead. In 1927, Ford grudgingly abandoned the Model-T and closed down his factories for six months while they converted to making new models. Arrogant? Ford had strong opinions and never shrank from expressing them. He ran for the US senate, but lost, and even seriously thought of standing for President. Though a brilliant mechanic, he had no qualifications to speak about world affairs. Racist? Ford bought a newspaper and got into big trouble writing offensive articles about Jewish people. But he was one of the first industrialists to employ black people and treat them fairly. Pacifist? When World War I broke out, this committed pacifist hired a huge ocean liner and sailed it round the world trying to make peace—earning nothing but ridicule. But during World War II, he turned his factory over to making thousands of bombers. Ford built his company up from nothing and was determined to keep control. Despite making his son Edsel president in 1919, Ford still made all the big decisions. He belittled Edsel and cruelly undermined his authority. Once, when Edsel ordered new coal ovens for the steel plant at River Rouge, Ford waited till they'd been built before ordering them to be demolished. Though Ford humiliated Edsel, he was devastated when his son died from cancer in 1943, aged only 49. The sparkle vanished from his eyes and he hurtled towards senility. He briefly became president of the Ford Motor Company once more, but couldn't remember what he was supposed to be doing or why. By now, Ford was unquestionably the world's greatest industrialist: he'd made a personal fortune of over $1 billion. But he was deteriorating into what his doctor described as "a pleasant vegetable" and died after a massive stroke in 1947, aged 83. Chariots thrived in the ancient Mediterranean and Middle-East. 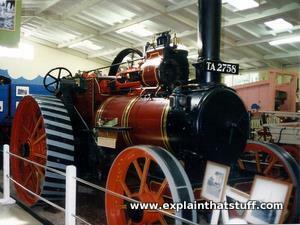 Steam-power was a product of 18th-century Britain. In the 19th century, French and German engineers built the first gasoline cars. At the start of the 20th century Henry Ford, an American, made simple cars people could afford. Ever since then, the miracle of the motor car has spread around the world... and changed the face of our planet. German dictator Adolf Hitler (1889–1945) gave Henry Ford a medal for making cars affordable. Inspired by the Model-T Ford, Hitler asked German auto-maker Dr Ferdinard Porsche to develop a simple people's car or "Volks Wagen" called the KDF (Kraft durch Freude or Strength through Joy). Renamed the Beetle, it sold over 20 million worldwide and was one of the most popular cars of the 20th century. 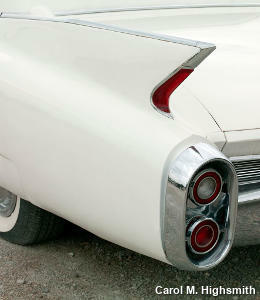 Photo: The aircraft-inspired tail lights and fins on a mid-century Cadillac. Photo by Carol M. Highsmith courtesy of Carol M. Highsmith's America, Library of Congress, Prints and Photographs Division. Ford wanted to keep cars simple to keep them cheap. But his "any color so long as it's black" message fell out of favor: people wanted comfort and style. In the 1930s, cars became sleek, glamorous, and "streamlined"; inside, they boasted luxuries like automatic gears and window defrosters. The end of World War II brought cars inspired by planes. Swaggering "gas guzzlers" were given tail fins like jet fighters—and burned almost as much fuel! Many countries launched huge roadbuilding schemes in the mid-20th century. Hitler helped to pioneer Germany's high-speed Autobahns in the 1930s, while his Italian pal Benito Mussolini (1883–1945) greatly expanded the Italian network of autostrade. Britain didn't start building motorways until the 1950s, when America also reorganized its major roads into a simple numbered network called the Interstate Highway System. Cuba has been cut-off from the United States since the Cuban revolution of 1959, so many Cubans still drive round in classic cars from the late 1950s. It's hard to buy new cars or spares for old ones! Before the fall of the Berlin Wall in 1989, eastern Europeans zipped around in 3 million ugly little cars called Trabants (or "Trabis"). They were cheap and cheerful—even cool in some ways, with recycled plastic body parts that lasted nearly 30 years. But their engines chugged like mowers and smoke belched from their exhausts. When communism collapsed, people drove their Trabants to the scrap heap at top speed. Only to find the plastic bits couldn't be recycled. In 1973, oil-rich states in the Middle East began to restrict exports—turning off the tap that supplied the world with oil. There were sharp hikes in fuel prices and queues of cars snaking from gas stations were a familiar sight. When the 1973 oil crisis hit home, the Brazilian government launched a major project to run the country's cars on ethanol made from sugar beet. Almost 30,000 filling stations in Brazil now sell ethanol, which supplies a fifth of the country's fuel. Henry Ford pioneered automation, but General Motors took it a quantum leap further in 1961. That's when the first-ever car-making robot started building car bodies at the GM plant in Ewing New Jersey. 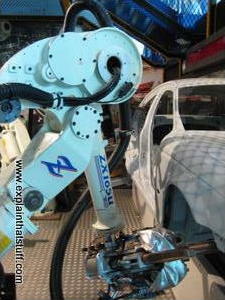 Photo: A modern car-welding robot at Think Tank, the museum of science in Birmingham, England. American and European car firms dominated car production till the 1970s. Then Japanese upstarts such as Nissan, Honda, Mazda, and Toyota began to undercut them by exporting cheaply made cars to the West. For a time, countries like the United States and Britain fought off these imports. So the Japanese went further and began exporting their factories instead. Honda became the first Japanese maker to open plants in the United States and Canada in the early 1980s. Car makers used to compete; now they cooperate. In the world of "globalization", big companies and their brands operate beyond national borders. New cars are expensive to design so makers in different countries work together to reduce costs. A Renault made in France might use exactly the same chassis, engine, or bodywork as a Nissan made in Japan. Another example of globalization is when a car plant in one country builds vehicles for more than one maker. Toyota and General Motors jointly run a plant like this in Fremont, California making parts for Toyotas, Pontiacs, and Chevrolets. Britain's car industry once employed over a million people and was the world's second-biggest producer after the United States. Today, the only big car plants left in Britain are run by Japanese firms and the once great names of British motoring—Jaguar, Rolls Royce, Bentley, and Aston Martin—are foreign-owned too. The Chinese are bicycle crazy: there are twice as many cycles in China as people in the United States. But all that could soon change. Car makers are eagerly turning their eyes to China, the world's fastest-growing car market, where sales are growing at 80 per cent a year. The country's biggest car maker, Shanghai Automotive, has already formed powerful alliances with big western firms including Fiat, General Motors, and Volkswagen. Who knows if we'll even be driving cars in the future? Companies like Google are now busily developing cars with onboard sensors that can navigate their way around the world while the people inside sit back and enjoy the view. Part robot, part computer, part old-fashioned automobile, these hybrid machines are likely to prove far safer and much more environmentally friendly than cars driven by careless, fallible humans. Despite what you might think, electric vehicles are actually older than gasoline-driven ones, but it's taken well over a century for them to catch on properly. Are the days of petrol and diesel finally numbered? Find out more in our main article about electric cars. Photo: You don't have to be crazy to drive this, but it helps. This is the Railton Mobil Special, a 1940s land-speed record car. Driven by John Cobb, it was the first car to go faster than 640 km/h (400 mph). Here you can see it from the front, with the aluminum bodyshell suspended high above the engine compartment. Cobb sat more or less between the two wheels at the front. See it for yourself at Think Tank, the museum of science in Birmingham, England. There's roughly one car for every ten people on the planet. A quarter of the world's cars are in America. Over 40 million new cars roll off the world's production lines each year. A typical American spends on average 18 days a year (72 minutes a day) behind the wheel of a car. The ski village of Zermatt in Switzerland has banned combustion-engines. Only emergency vehicles can use them. All other vehicles have to be electric. Japanese firms make the most cars—around a quarter of the world's entire fleet. In 2006, Japanese firms built more cars overseas (10.93 million vehicles) than at home for the first time ever. Some of them are even exported back to Japan! America has 6.3 million km (3.9 million miles) of highways—enough to go from Earth to the Moon 16 times. There's really nowhere better to learn about car history than at a car museum. Here are a few to check out. If you know of any other good ones, please let me know and I'll add them in here. Beaulieu National Motor Museum: A famous car museum in the south of England. 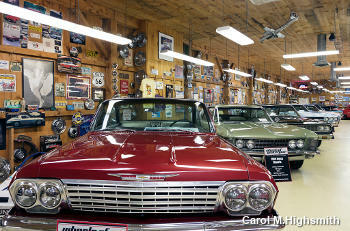 Classic Car Museum: Handy for visitors on the East Coast of the United States, this museum is Located in Norwich, NY. Gilmore Car Museum: A museum in the American Midwest (in Lansing, Michigan). Haynes International Motor Museum: Another big car museum in England's West Country. 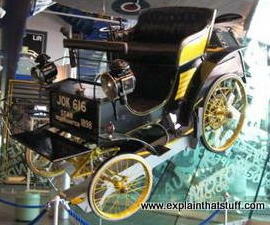 London Motor Museum: A small but still interesting museum in the English capital city. Petersen Automotive Museum: Motor museum in Los Angeles, California. Wheels of Yesteryear: The museum where our top photo was taken, at Myrtle Beach, South Carolina. 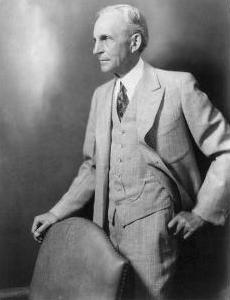 The People's Tycoon: Henry Ford and the American Century by Steven Watts. Vintage, 2006. A fascinating and very readable account of Ford's life and achievements. The Car—a History of the Automobile by Jonathan Glancey. Carlton, 2008. A photographic history of cars and their social impact. Car: The Definitive Visual History of the Automobile. Dorling Kindersley, 2011. A coffee table look at car history, including huge closeup photos of classic car engines and the stories of great car marques (brands). Car Science by Richard Hammond. Dorling Kindersley, 2008. A great introduction to the science that powers cars—including, engines, gears, hydraulics, and aerodynamics. Eyewitness Car by Richard Sutton. Dorling Kindersley, 2005. A general introduction to car science, technology, and history for ages 9–12 (and perhaps a bit beyond). How Cars Work by Tom Newton. Black Apple Press, 1999. Each page of this illustrated book explains one major part of a car. Time for Kids: Henry Ford by Dina El Nabli. HarperCollins, 2008. A readable, well-illustrated, 50-page biography for younger readers aged 7–9. Cars of the World by J.D. Scheel. Methuen, 1963/1971. A lovely illustrated history that's well worth tracking down in secondhand book stores. Each chapter charts the development of cars in a different country, ranging (alphabetically) from Austria to the United States.